This example shows how to capture a Windows Form image and print it. The image is resized and centered to fit the Print Margins. 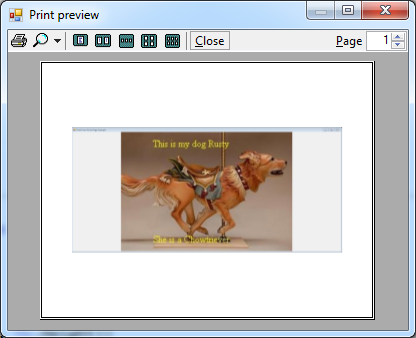 The example shows the Print Preview dialog. To print click the Print button on the dialog. Many programmers attempt this with the old Power Pack Printform control. However that control is out of date, limited, and not easily modified. There is really no need to use the Power Pack it is all built into VB now. Text = "Print Form Fit to Page Example"
To use the examples make a new project with one Form. Past the example code into the form as shown. Run the example.